There’s nothing more peaceful than the sights and sounds of a garden pond full of colorful fish. Whether you decide you want a pond primarily as a water garden or to enjoy koi or goldfish, both life forms complement each other to maintain a healthy ecosystem. Fish are attractive to look at and bring movement into your pool; they eat and thus help control other organisms such as mosquito larvae and plant pests; and they help fertilize the aquatic plants with their excreta and provide carbon dioxide through their respiration to aid photosysnthesis. Floating plants, on the other hand, protect baby fish and keep the pond cool and algae resistant by shading the water from direct sunlight. Other elements of a healthy pond include pumps, waterfalls, or fountains to circulate the water, lights around or inside the pool, and other special equipment to keep it clean. Your pond may be the initial focal point around which you design the rest of your landscape or you may add it later to enhance your enjoyment of the yard that is already there. 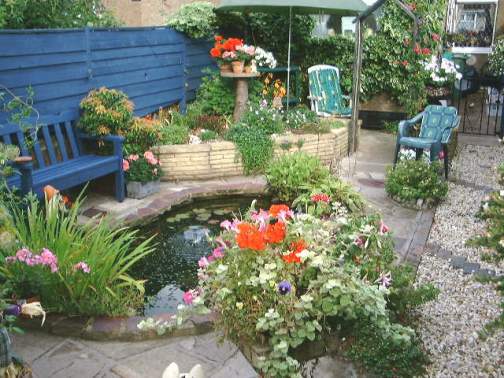 Either way, becoming a pond enthusiast will add a satisfying new dimension to your life and your home. When building a fish pond, there are many design details you must consider. The most simple and most important would be the size of your pond. Many enthusiasts that have built their own pond always seem to regret not building a bigger pond. This is because almost everyone wants to constantly add more Koi to their ponds and after a while, the pond can’t accommodate all of the fish. This is why before building a fish pond you must thoroughly consider how many fish you are willing to keep and how big the pond must to in order to accommodate all of those fish. Another consideration you should think about is the potential danger of predators in the area. Raccoons and cats are also common predators of pond fish that should be considered. Some fish also require lots of shade to rest in. Plan out in advance the type of vegetation that you will be planting for this purpose. Filtration is also another important factor in building a fish pond. Certain fish require optimum water cleanliness and so the filtration system should be considered very important. Even if it costs a little more money, go with a filtration system that is reliable and suitable for your pond. Don’t think that a smaller system will support your large pond because you don’t have many fish. The number of fish can always go up and your filtration system won’t be able to keep up if it does. When building a fish pond, everything should and must be thought through. Be sure to write everything down so that you won’t forget during the building process. If you take your time planning, building will be a breeze and you will encounter less problems afterwards as well.